Elephants are a special band. Not just because of their songs are good but mostly because for such a young and newly formed band their sound is almost perfectly formed and their live performance is done with such confidence. 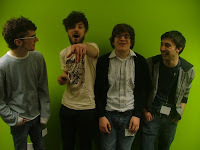 They're from Folkstone and have had plenty of Radio 1 airplay including a session they did for Huw Stephens at Maide Vale Studios!